BER Cert, Ireland. Building Energy Rating for domestic homes & property; energy audits - Building Energy Rating Ireland. Building Energy Rating Ireland provide quality assured Building Energy Rating (BER) Certificates. Our team consists of qualified assessors and consultants with both academic and practical structural experience. We offer an independent and high quality service with on-going back-up support to our clients. Our assessors have undergone one of the most rigorous training programmes in the marketplace through the Dublin Institute of Technology. Energy is vital to nearly all aspects of our daily lives - but we rarely stop to think about how or why we use it. As the price of energy continues to rise, now is the ideal time to consider what you can do to be more energy efficient. The good news is that there are many simple ways to use energy more efficiently that will save money and benefit the environment. 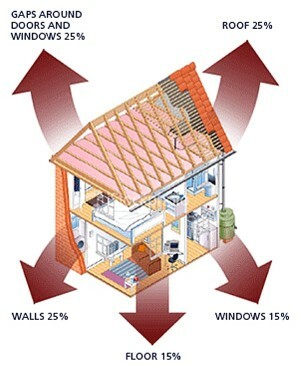 Much of the heat loss from a house occurs through the windows particularly if they are single glazed. Keep curtains closed at night and ensure that the curtains dont hang over the radiators. A reflective foil, backed by insulation if space permits should be fixed behind radiators mounted on external walls. A lagging jacket on your hot water cylinder will keep water hotter for longer and pay for itself in 2-3 months. If replacing the hot water cylinder, a cylinder with factory applied insulation should be considered. Such insulation is more effective at retaining heat than a lagging jacket, is less easily damaged and cannot be pulled out of place.